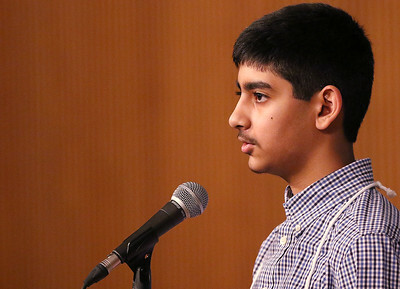 Matthew Apgar - mapgar@shawmedia.com Ved Patel of Cary Junior High School smiles back to Sajiv Shah of Prairie Grove Junior High School after Shah spelled out the word "Patel" during the annual McHenry County Spelling Bee on Wednesday, March 02, 2016 at McHenry County College in Crystal Lake. 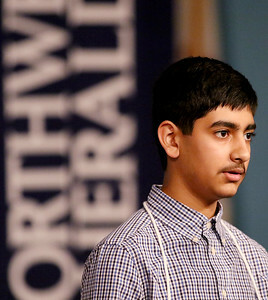 Matthew Apgar - mapgar@shawmedia.com Ved Patel of Cary Junior High School spells out his word during the annual McHenry County Spelling Bee on Wednesday, March 02, 2016 at McHenry County College in Crystal Lake. 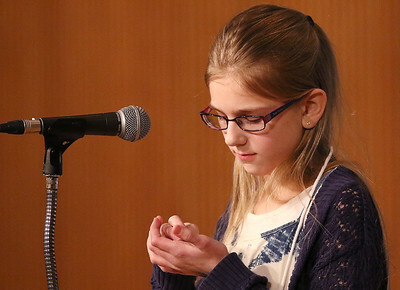 Matthew Apgar - mapgar@shawmedia.com Serena Huberty of Richard Bernotas Middle School uses her finger to write out an imaginary word onto her palm during the annual McHenry County Spelling Bee on Wednesday, March 02, 2016 at McHenry County College in Crystal Lake. 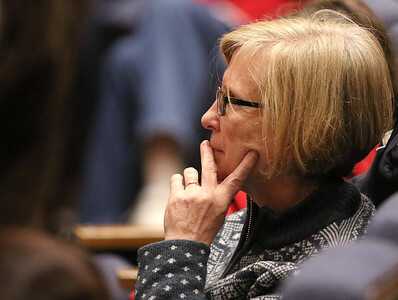 Matthew Apgar - mapgar@shawmedia.com Jillian Popovich of St. John the Baptist Catholic School ponders a word during the annual McHenry County Spelling Bee on Wednesday, March 02, 2016 at McHenry County College in Crystal Lake. 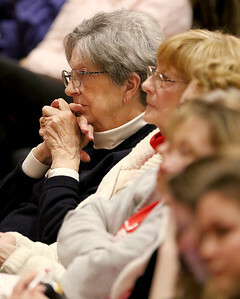 Matthew Apgar - mapgar@shawmedia.com Audience members watch as the annual McHenry County Spelling Bee gets underway on Wednesday, March 02, 2016 at McHenry County College in Crystal Lake. Matthew Apgar - mapgar@shawmedia.com Tagan Gizel of Riverwood Elementary School, right, applauds at the end of a round in which Ian McEwan of Marengo Middle School, left, was eliminated from competition in the annual McHenry County Spelling Bee on Wednesday, March 02, 2016 at McHenry County College in Crystal Lake. 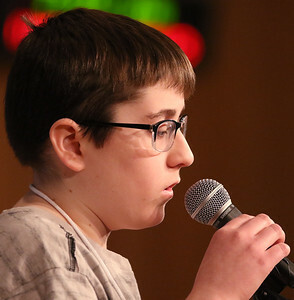 Matthew Apgar - mapgar@shawmedia.com Pronouncer Linda Riggs gets help with a word from 4-time McHenry County Spelling Bee Champion Lucas Urbanski during the annual McHenry County Spelling Bee on Wednesday, March 02, 2016 at McHenry County College in Crystal Lake. 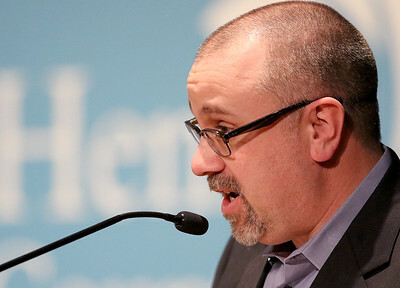 Matthew Apgar - mapgar@shawmedia.com Northwest Herald editor Jason Schaumburg talks to the crowd at the annual McHenry County Spelling Bee on Wednesday, March 02, 2016 at McHenry County College in Crystal Lake. 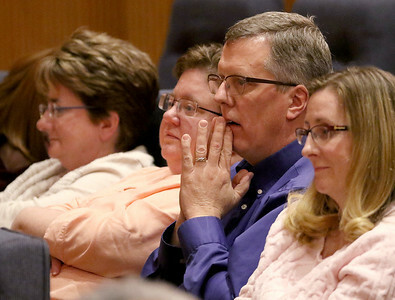 Matthew Apgar - mapgar@shawmedia.com Audience members watch nervously as students compete in the annual McHenry County Spelling Bee on Wednesday, March 02, 2016 at McHenry County College in Crystal Lake. 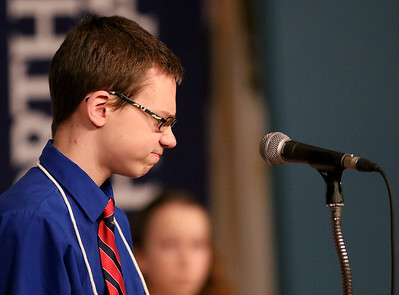 Matthew Apgar - mapgar@shawmedia.com Ian McEwan of Marengo Middle School reacts after incorrectly spelling his word during the annual McHenry County Spelling Bee on Wednesday, March 02, 2016 at McHenry County College in Crystal Lake. 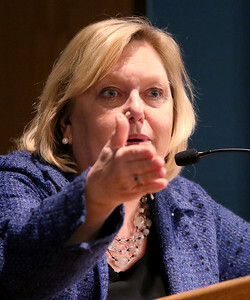 Matthew Apgar - mapgar@shawmedia.com Pronouncer Linda Riggs announces a word to be spelled at the annual McHenry County Spelling Bee on Wednesday, March 02, 2016 at McHenry County College in Crystal Lake. 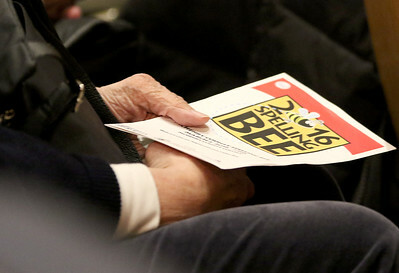 Matthew Apgar - mapgar@shawmedia.com An audience member grasps a program for the annual McHenry County Spelling Bee on Wednesday, March 02, 2016 at McHenry County College in Crystal Lake. 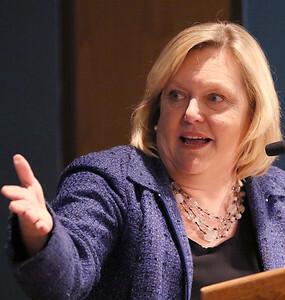 Matthew Apgar - mapgar@shawmedia.com Leslie Schermerhorn, Regional Superintendent of Schools, talks to the crowd at the annual McHenry County Spelling Bee on Wednesday, March 02, 2016 at McHenry County College in Crystal Lake. 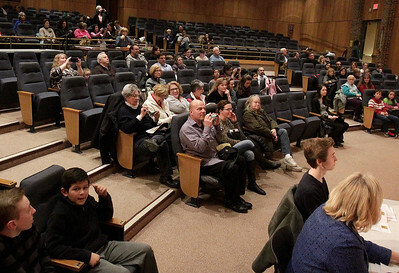 Matthew Apgar - mapgar@shawmedia.com Audience members applaud students competing in the annual McHenry County Spelling Bee on Wednesday, March 02, 2016 at McHenry County College in Crystal Lake. 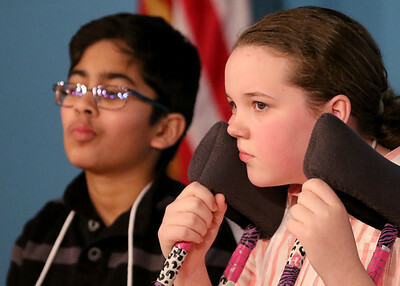 Matthew Apgar - mapgar@shawmedia.com Sajiv Shah of Prairie Grove Junior High School, left, and Jillian Popovich of St. John the Baptist Catholic School watch from their seats as another competitor takes the stage in the annual McHenry County Spelling Bee on Wednesday, March 02, 2016 at McHenry County College in Crystal Lake. 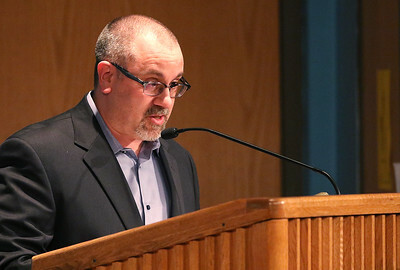 Matthew Apgar - mapgar@shawmedia.com Christian Graves of Zion Lutheran School spells out his word during the annual McHenry County Spelling Bee on Wednesday, March 02, 2016 at McHenry County College in Crystal Lake. 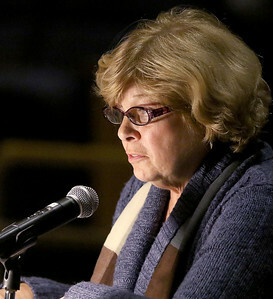 Matthew Apgar - mapgar@shawmedia.com Pronouncer Linda Riggs calls out a word during the annual McHenry County Spelling Bee on Wednesday, March 02, 2016 at McHenry County College in Crystal Lake. 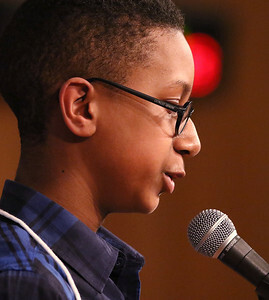 Matthew Apgar - mapgar@shawmedia.com Amari Ahmad of Heineman Middle School spells out his word during the annual McHenry County Spelling Bee on Wednesday, March 02, 2016 at McHenry County College in Crystal Lake. 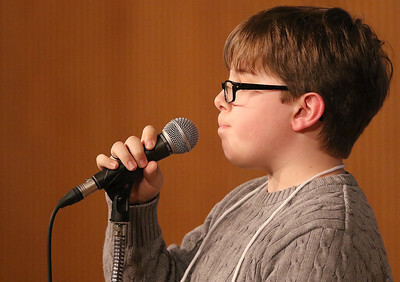 Matthew Apgar - mapgar@shawmedia.com Nicholas Mrozek of Nippersink Middle School watches as Tagan Gizel of Riverwood Elementary School spells out a word during the annual McHenry County Spelling Bee on Wednesday, March 02, 2016 at McHenry County College in Crystal Lake. 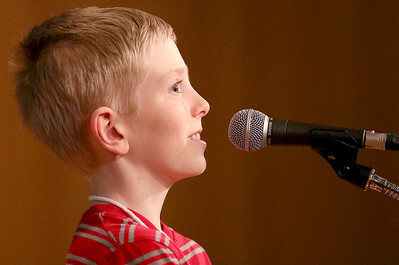 Matthew Apgar - mapgar@shawmedia.com Justin Chase of Mary Endres Elementary School spells out his word during the annual McHenry County Spelling Bee on Wednesday, March 02, 2016 at McHenry County College in Crystal Lake. 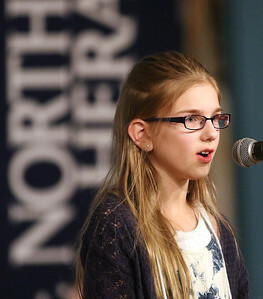 Matthew Apgar - mapgar@shawmedia.com Georgia Sedlack of Olson Elementary School spells out her word during the annual McHenry County Spelling Bee on Wednesday, March 02, 2016 at McHenry County College in Crystal Lake. 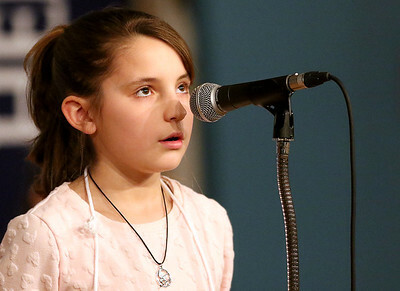 Matthew Apgar - mapgar@shawmedia.com Tagan Gizel of Riverwood Elementary School spells out a word during the annual McHenry County Spelling Bee on Wednesday, March 02, 2016 at McHenry County College in Crystal Lake. 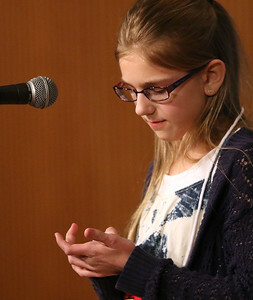 Matthew Apgar - mapgar@shawmedia.com Serena Huberty of Richard Bernotas Middle School uses her palm to write an imaginary word during the annual McHenry County Spelling Bee on Wednesday, March 02, 2016 at McHenry County College in Crystal Lake. 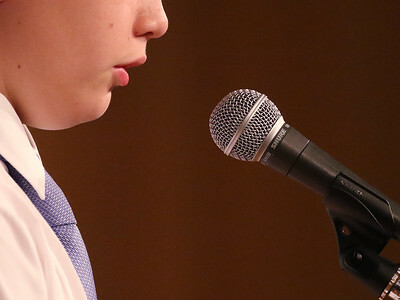 Matthew Apgar - mapgar@shawmedia.com Nicholas Mrozek of Nippersink Middle School spells out his word during the annual McHenry County Spelling Bee on Wednesday, March 02, 2016 at McHenry County College in Crystal Lake. 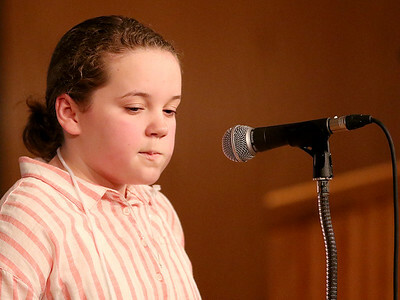 Matthew Apgar - mapgar@shawmedia.com Serena Huberty of Richard Bernotas Middle School spells out her word during the annual McHenry County Spelling Bee on Wednesday, March 02, 2016 at McHenry County College in Crystal Lake. 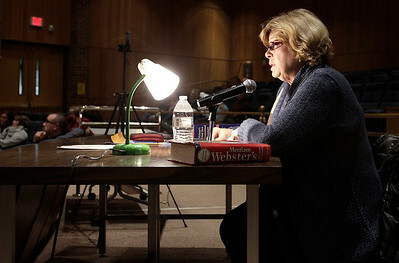 Tagan Gizel of Riverwood Elementary School, right, applauds at the end of a round in which Ian McEwan of Marengo Middle School, left, was eliminated from competition in the annual McHenry County Spelling Bee on Wednesday, March 02, 2016 at McHenry County College in Crystal Lake.